We’d love your help. Let us know what’s wrong with this preview of Home Economics by Jennifer McKnight-Trontz. To ask other readers questions about Home Economics, please sign up. I found this book very intellectually dishonest -- while the author is listed as a "compiler" of out-of-copyright wisdom from old home making texts, complete sentences were lifted wholesale without attribution other than the bibliography at the end. I recognized some of the choicest quotes from The American Frugal Housewife Dedicated to Those Who Are Not Ashamed of Economy in this little book before I read the "disclaimer" at the end and I was (justifiably) annoyed. With public domain books this I found this book very intellectually dishonest -- while the author is listed as a "compiler" of out-of-copyright wisdom from old home making texts, complete sentences were lifted wholesale without attribution other than the bibliography at the end. I recognized some of the choicest quotes from The American Frugal Housewife Dedicated to Those Who Are Not Ashamed of Economy in this little book before I read the "disclaimer" at the end and I was (justifiably) annoyed. With public domain books this is perfectly legal, yes, but still a crappy thing to do. Citations should be more explicit, and linked to the name of the original work. 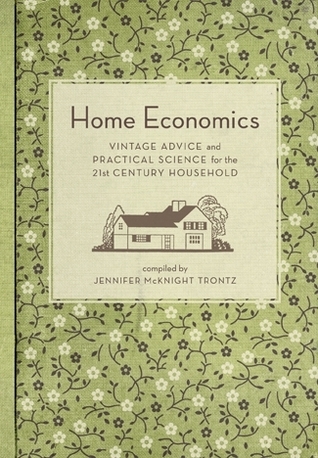 A great lil tome called, Home Economics: Vintage Advice and Practical Science for the 21st-Century Household. It opens up right to a book plate. You never see that anymore. Wait you do know what a bookplate is don't you? You know, that lil place where it says, This book belongs to _____________. Remember as a child how proud you felt to write your name in there. Often I would have a Christmas present with my grandmothers beautiful handwriting inside. There she placed my name and the occasion tha A great lil tome called, Home Economics: Vintage Advice and Practical Science for the 21st-Century Household. It opens up right to a book plate. You never see that anymore. Wait you do know what a bookplate is don't you? You know, that lil place where it says, This book belongs to _____________. Remember as a child how proud you felt to write your name in there. Often I would have a Christmas present with my grandmothers beautiful handwriting inside. There she placed my name and the occasion that I received the book. Well it goes on from there. Actually there is so much in this lil book. You can go from economical living which goes by the new buzz word of frugal living. And who can not use help with ideas of how to save in the kitchen. I love that there is a section on home-baked bread. That is something I have never mastered. But plan on working on with the help from my lil handbook. Of course we can go on to the care of our clothes. Granny M is the seamstress in our family. I thank God for that. But College Girl is learning that art too. So maybe I will be able to rely on them for that area. The next chapter is where I shine. That is on caring for my home. I love cleaning something til it shines. And even more so rearranging my house. Giving it that new touch and tweak. But we continue on to leisurely pursuits. When was the last time you pursued leisure? Really enjoying your time off? Instead of filling it with chores, errands and frantic activity. Can you remember how it feels to have a nice dinner party where you relax too? That tending your garden can bring a zen feeling. How about time to just sit and work on a craft or needle work? A classic hope-chest-kind-of-book for the housewife-to-be or the homeschooled daughter who could use a concise introduction to the lost art of domesticity. I'll be saving this one for my little girl in the coming years. "The true economy of housekeeping is simply the art of gathering up all the fragments so nothing is lost. This applies to both materials and time (p. 9)." My favorite bits were on setting up a routine, reusing scraps of fabric, the science of folding laundry, 10 recipes for natural A classic hope-chest-kind-of-book for the housewife-to-be or the homeschooled daughter who could use a concise introduction to the lost art of domesticity. I'll be saving this one for my little girl in the coming years. A cute little book - odds and ends from Home Ec textbooks from the '20s through the '40s, with happy illustrations. I am such a sucker for this sort of thing, especially when I pick up a useful tip or two. The introduction is snappy, but the tips, although helpful, are also super dry. This book is not your average book, but is rather a concise compilation of vintage homemaking advice which the author considers relevant and still applicable to the modern era. I have to agree, too. It is truly wonderful read with a uniquely vintage appeal. It is an immense read, for starters- much longer than the average books of the actual eras it is compiled from (and it is compiled from many). When I first picked it up, I did what I always do and skim read it to see what it contained. Now I h This book is not your average book, but is rather a concise compilation of vintage homemaking advice which the author considers relevant and still applicable to the modern era. I have to agree, too. It is truly wonderful read with a uniquely vintage appeal. It is an immense read, for starters- much longer than the average books of the actual eras it is compiled from (and it is compiled from many). When I first picked it up, I did what I always do and skim read it to see what it contained. Now I have been reading it every day during the half hour I wait at the school for the child I babysit each week and am no more than 26% of the way through it even after 3 weeks or so. Still, at only 26% I feel it is wonderful enough to warrant an early review. There is a plethora of information on every conceivable topic concerning the home, and not an ounce of it is outdated though it takes its cue from vintage manuals. What I find wonderful about it, though, is that it does not simply stop at the standard household care, but also covers such things as leisure time, frugal living, etiquette, table settings, embroidery and hand stitching, home decoration, and more. The additional bits it contains- from recipes, to tips and tricks- are a wonderful addition and I plan on implementing many of them. There is so much wonderful advice, even, that I am certain I have highlighted over half of what I have read in depth of the book at this point. I am genuinely excited to continue reading it and discovering what else it contains. Altogether, it is well written. The tone does come across as a bit condescending in some areas, but those are easy to overlook compared to the bulk of the tonality and may simply be due to the fact that the majority of the information is compiled as opposed to written entirely from scratch. Given this is the case, there is bound to be tonality and other minor conflicts. Really, there are few (if any) errors in the book- or at least none so noticeable that they would greatly impact the quality, even if the organization could use just a tad more work in some areas. Its true shining glory, however, is the fact that is has a complete index and a bibliography- two very rare things in many cases. Without judgement or bias, I found this cute little book to be a very good resource for any unfamiliar with the basics of adult living, and a good refresher for those of us that know most of the information presented. The layout could have been better, but as it is it's already well done and easily accessible. Perhaps some people find a focus on home economics to be backwards and oppressive to women. I think it is backwards for anyone living in a home not to try to make it functional and pleasant. I find it oppressive to families to not have basic knowledge of how to make a home run smoothly. This book is great and packed full of basic, sound advice that should never have gone out of style! This is a cute little book that offers helpful and fun advice for maintaining a clean, sanitary and happy home. It actually has some good ideas and illustrations. Loved the little tips in red sprinkled throughout the book. I liked this book so much I actually bought it. Probably more for the look of it than the content. I just want to cut it up it's so cute. I bought this book on impulse because of the cute cover. I actually read it and it is really useful for me a teenager in doing household chores. Chock full of old-school wisdom and skills that have long been forgotten. Nice to see someone carrying it on. What a wonderful little book. Taken from collected material from old home economic books, this book is not only practical but nostalgic and fun. Everything we have been searching for and didn't know it. To think it was all figured out! Here we sit trying to reinvent the wheel! A handy, wonderful book that all peeps should keep on hand!